If you and I were friends in real life, you would know that every year we have an end of summer BBQ in my backyard, where family and friends gather together for what may be the first and last time of the season. You would know that there would be plenty of beer and wine to drink with an over bountiful table of food – and there would probably be something, somewhere on that table that your taste buds had never tried before. We’d all find seats in my little yard under twinkling lights and chat about a variety of things, but you would know that when you get a group of nurses around there is no topic off limits! 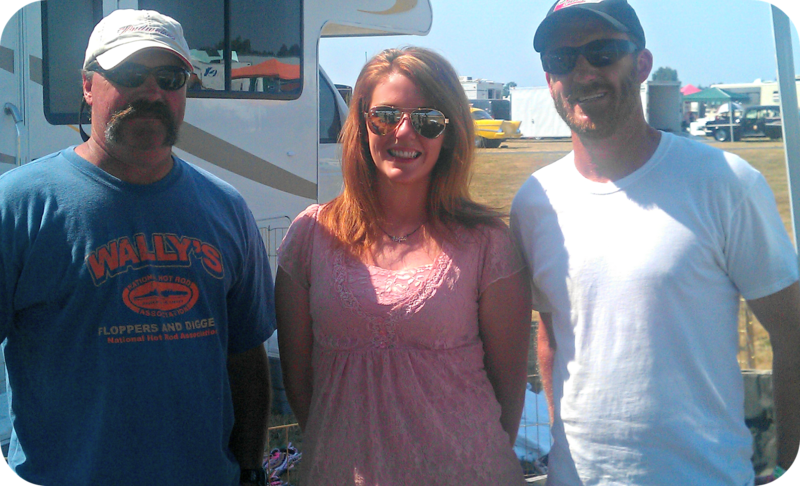 We would stuff our stomachs full of food and then I’d bring out the desserts; pies, cookies, ice cream floats. We’d chat until late in the evening, and I wouldn’t let you leave until I’d had my fare share of photographs with you. – It’s coming again. 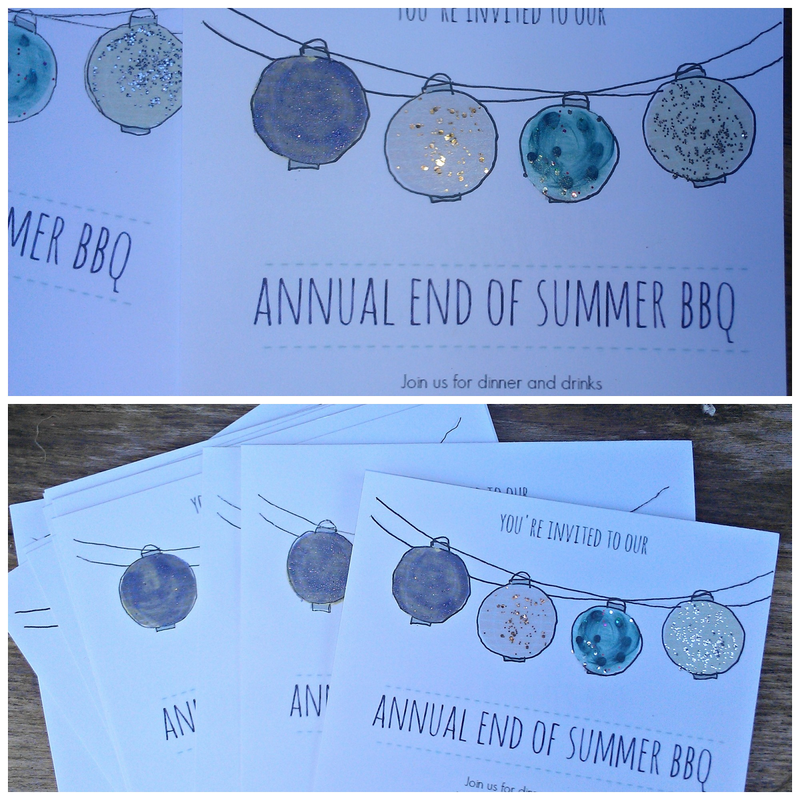 Last year was our Blue Moon BBQ , this year our BBQ will be even better, and I want to show you updates with my party progress, starting with my invitations that I personalized. You will need just a couple things to make them. First of all, decide on a theme. Or browse around and find the perfect card and let that make the decision for you. 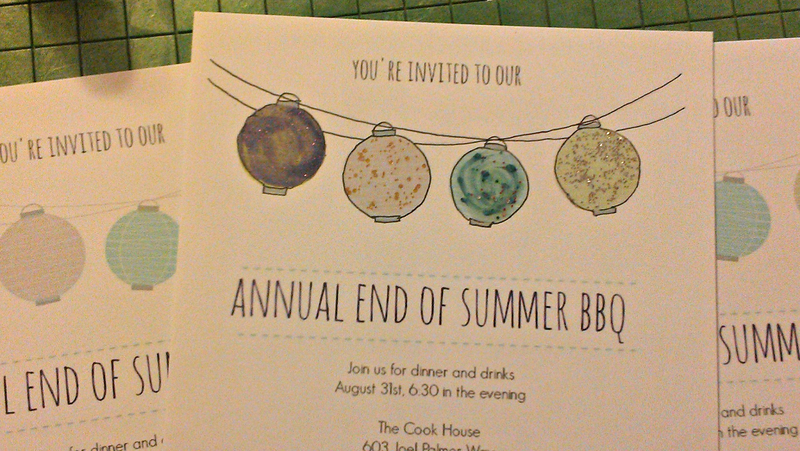 I used some clip art and Picmonkey to create these simple invites with Chinese lanterns on them. 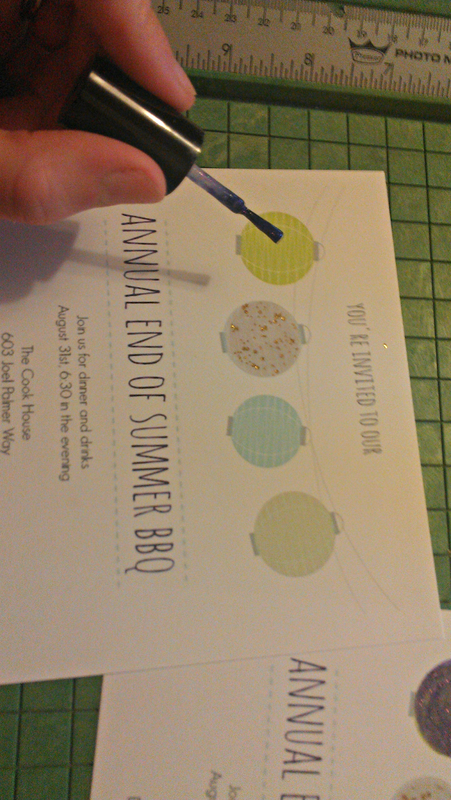 Make sure you size them invites correctly. 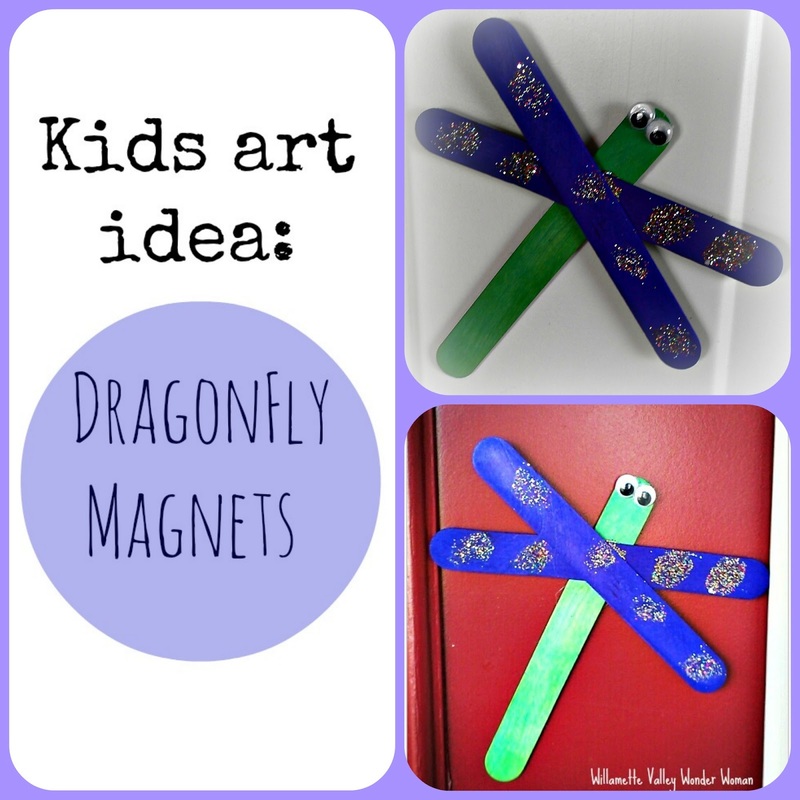 Then save the pictures and print them onto heavy card stock. Then cut each one out and embellish. 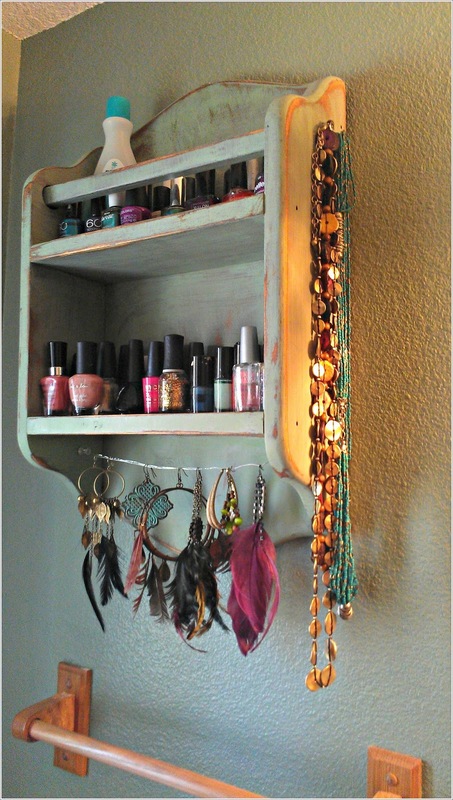 I made my lanterns stand out more with black ink, and – you guessed it – nail polish. Why not? 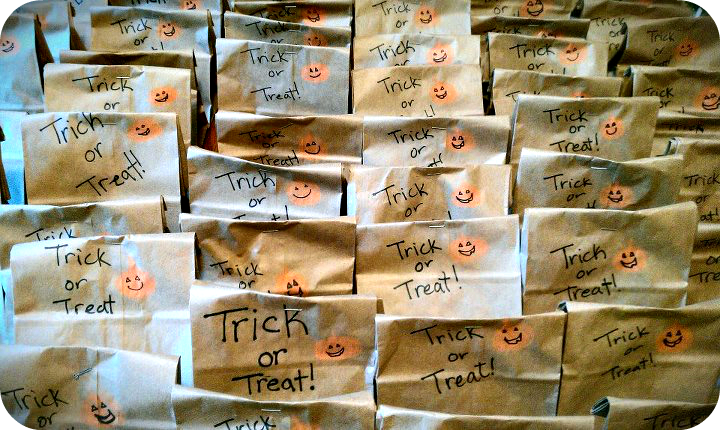 All it takes is a little time and creativity and you can save yourself a bunch of cash. 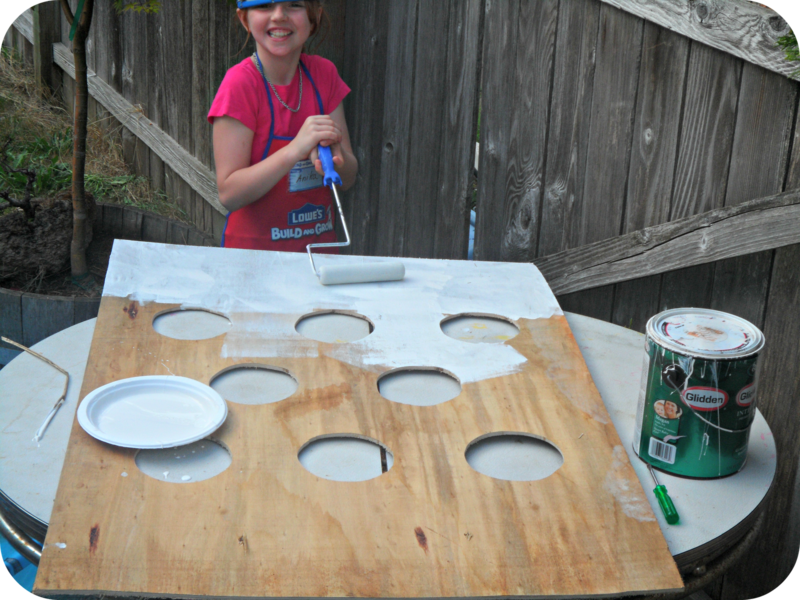 Stay tuned for more posts as I cover all my DIY’s leading up to the party on August 31st! Okay, I will begin with this: I don’t have a green thumb. Probably because I don’t feel like I have the time it takes to keep up with everything, or perhaps because I just am super forgetful with watering. BUT we have found something that lets us have a little something without being overwhelming. 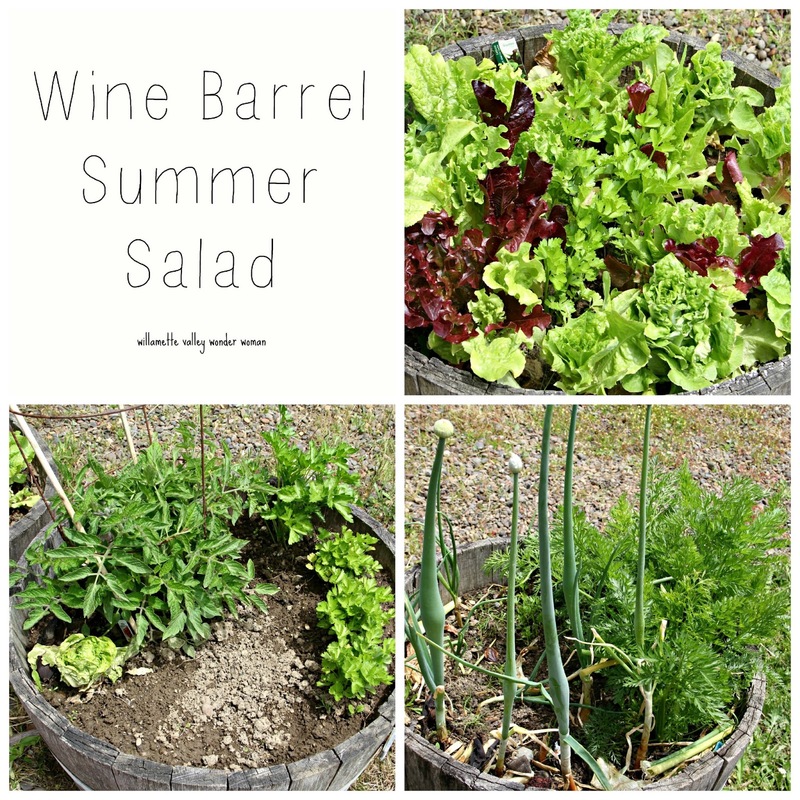 A little salad garden in wine barrels. We have several different kids of lettuce, leeks, carrots, peas, celery, and tomatoes (not pictured). How fun is it to be able to walk into your yard and make a little salad for dinner? Doesn’t get any fresher than that! And it teaches the kids how to grow and appreciate the food, and makes eating salad a little bit more fun, knowing that you grew it yourself. 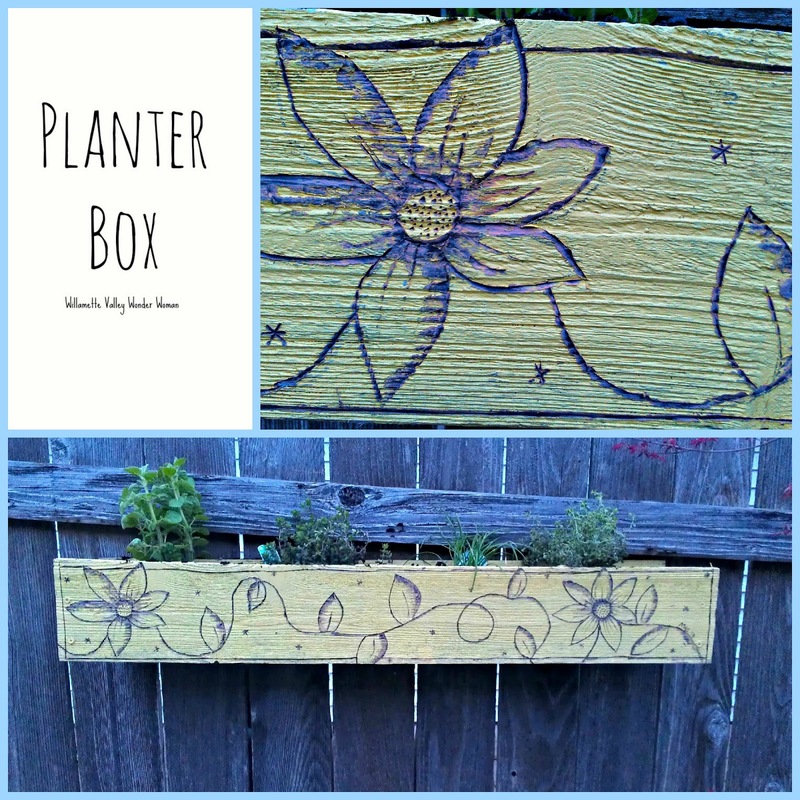 What unique garden ideas have you done? Today I just wanted to share with you a little project that began last summer that I finally completed about a month ago. When we were rebuilding the fence last year we ended up with some old fence posts lying around. Well, I decided to get a little creative. 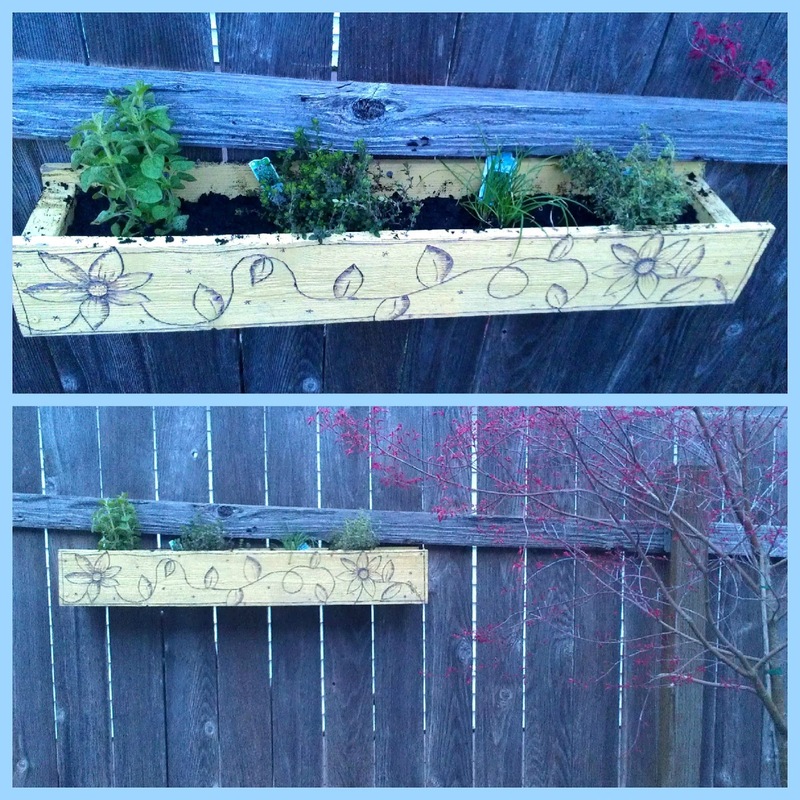 I had been wanting an herb planter box for quite some time, so I finally decided to make my own. I have all of the pictures on how I actually made this, but they are on a SD card somewhere that I will have to locate. 🙂 In the mean time I will show you what I did after I built it. I painted it a cheery bright yellow that will stand out in the many cloudy dreary Oregon days of drizzle that we have. Then I tried wood burning for the first time ever. I think it turned out rather well. Hello everyone! 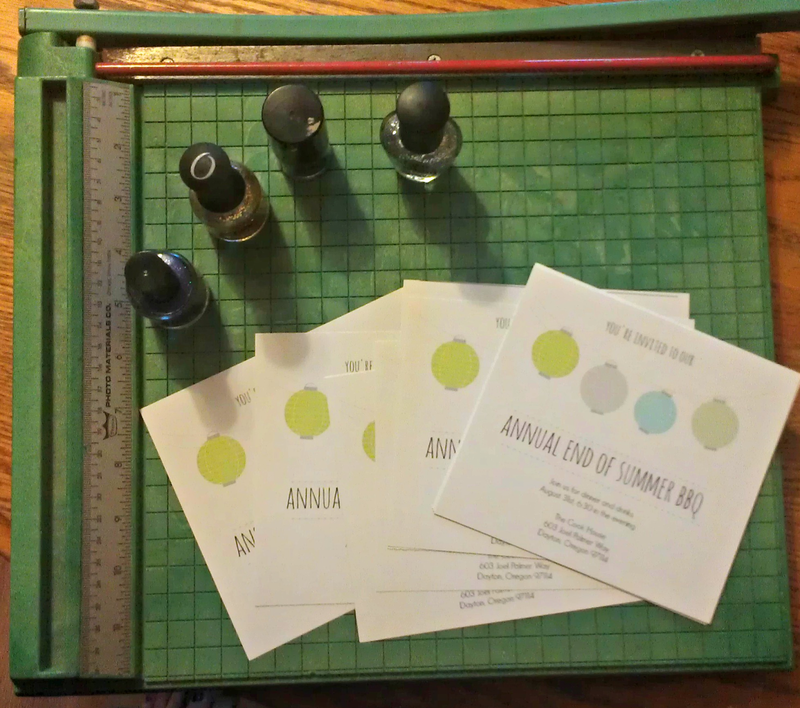 Today I want to share a little thing I’ve done to help simplify my life a little more! 🙂 This is my new nail polish holder! 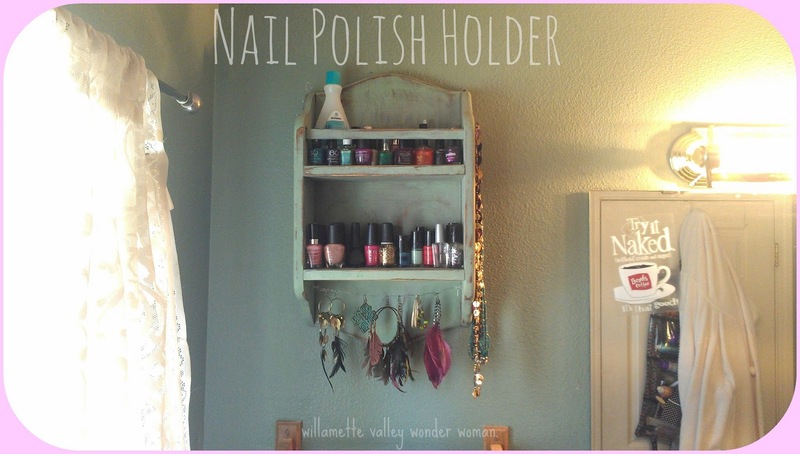 I’ve had such a messy nail polish collection that I just couldn’t keep organized. In fact, I had them all in the bathroom window seal which really didn’t work that well because they kept getting bumped off, and the kids liked to snitch them sometimes (which is really not good). Here’s what I did. While at the Jane Austen Craft Faire last week I found a couple adorable items that I had actually been in search of for a while; one of them being an old spice rack. I think I originally saw this idea on Pinterest (where else?) I snatched it up for $15 and took it home. Coincidentally it is like the exact same color as my bathroom walls! 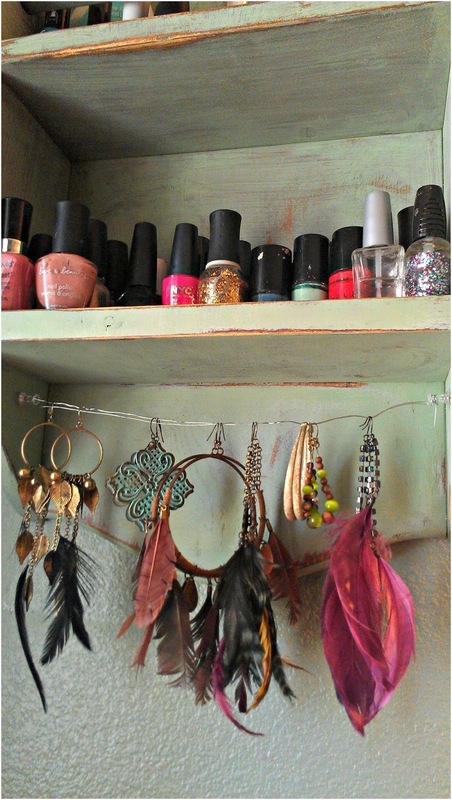 I actually attached it to the wall upside down and then went ahead and placed some wire across the bottom to hold my feather earrings and a hook on the side for some necklaces. 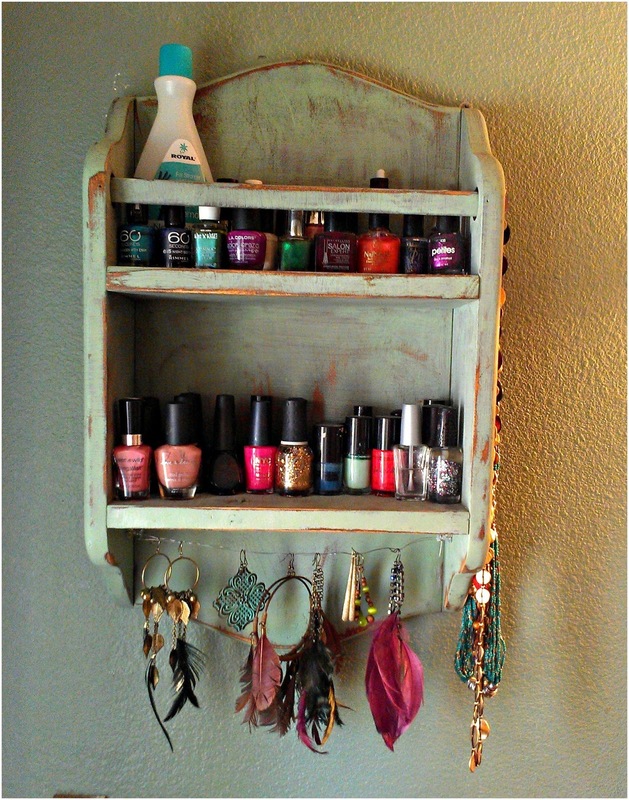 All of my nail polishes are now up and out of the way, out of the kids reach, and it just looks so much cuter this way! Hello! I hope every one’s week is going well. This week and next week I’ve got extra hours at work, so things have been slacking a little bit on the home front. 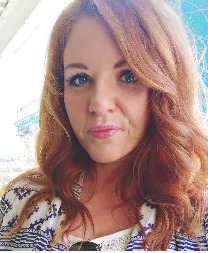 SO last Saturday was this little blogs one year anniversary! I can’t believe its been a year since I wrote this tiny little post! Thanks to everyone along the way who has encouraged me to, well, to be me. I appreciate all of the kind words. 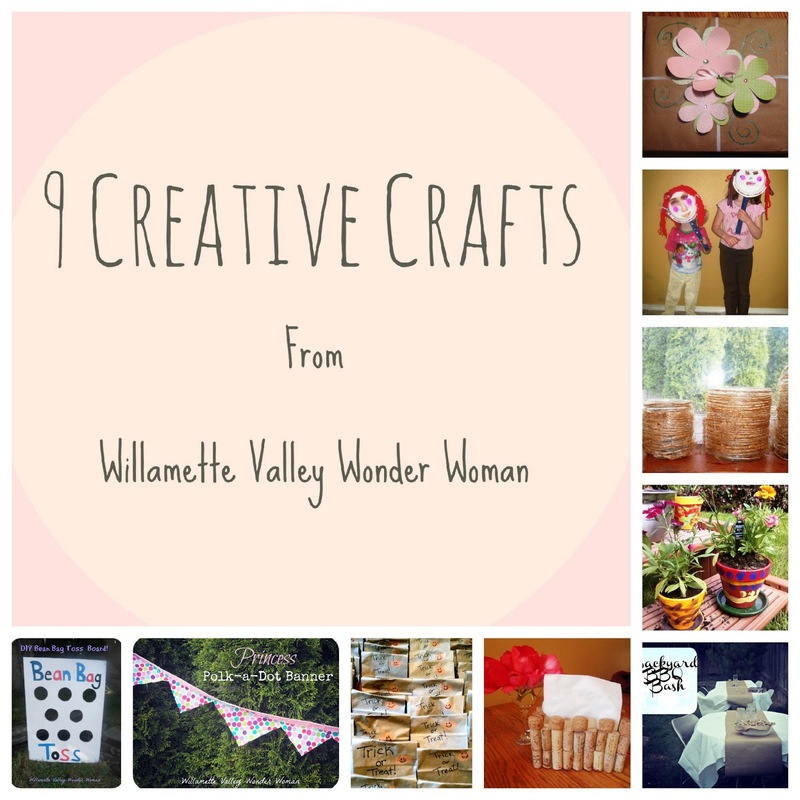 I thought since this is my one year anniversary I would highlight my favorite craft projects throughout the year. I adore creating things, I think its the only time I can free my mind. 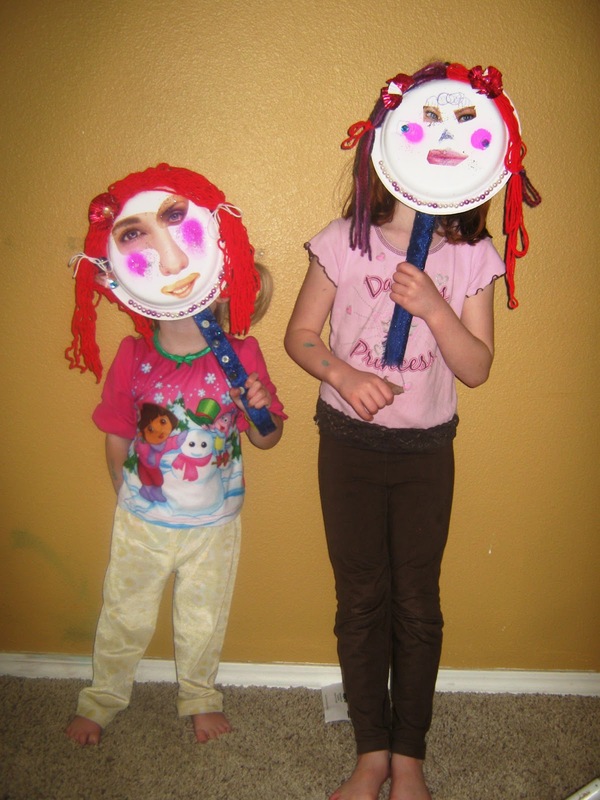 In May the girls and I made some fun little Paper Plate Masks and I showed how I spruced up some old jars to make tea light candle holders. In June I bragged up my adorable painted flower pots the girls made for me. 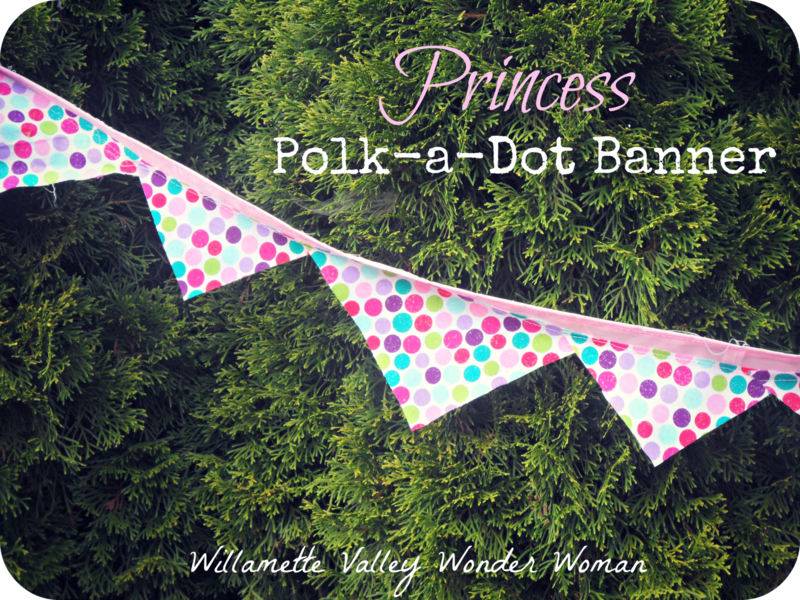 In August, I got really fancy and made this princess polka dot birthday banner for Anika’s big party, and SHE painted this bean bag board as well. 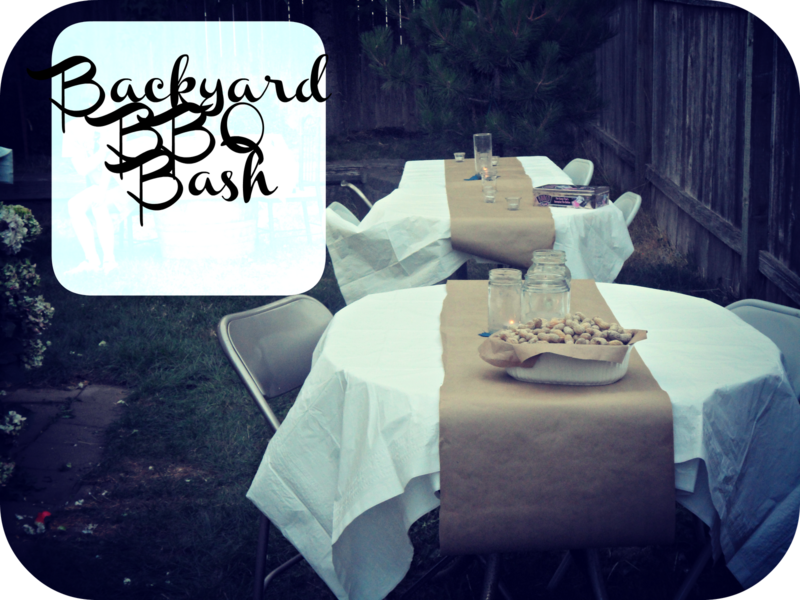 In September we had our Backyard Blue Moon party and I created some simple tablecloths to match the casual feel to the party. This is an adorable card that my 9 year old created for her 5 year old sister. I thought it was such a cute idea that I had to share. 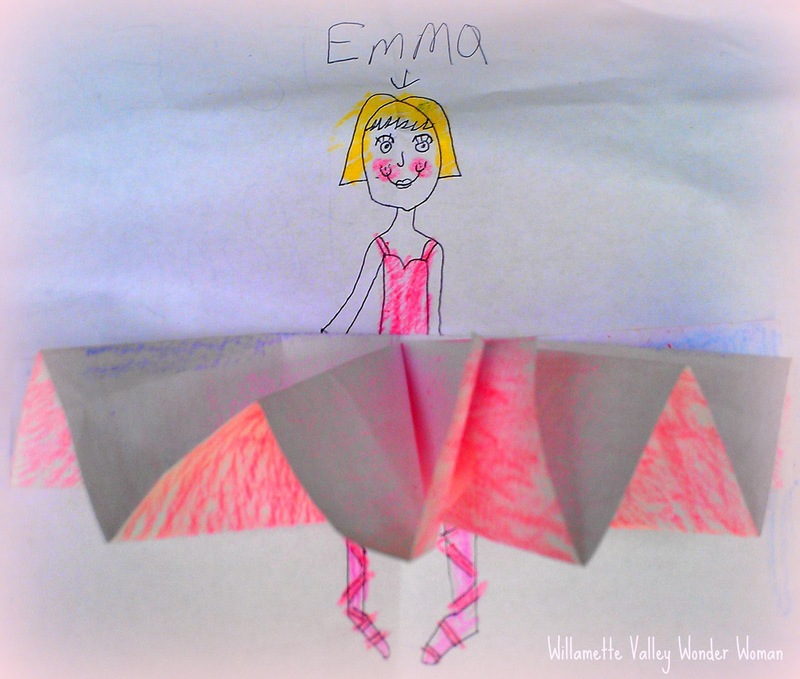 This could be used for any kind of party invitation, and the best part is the girl’s can help you make and color them. 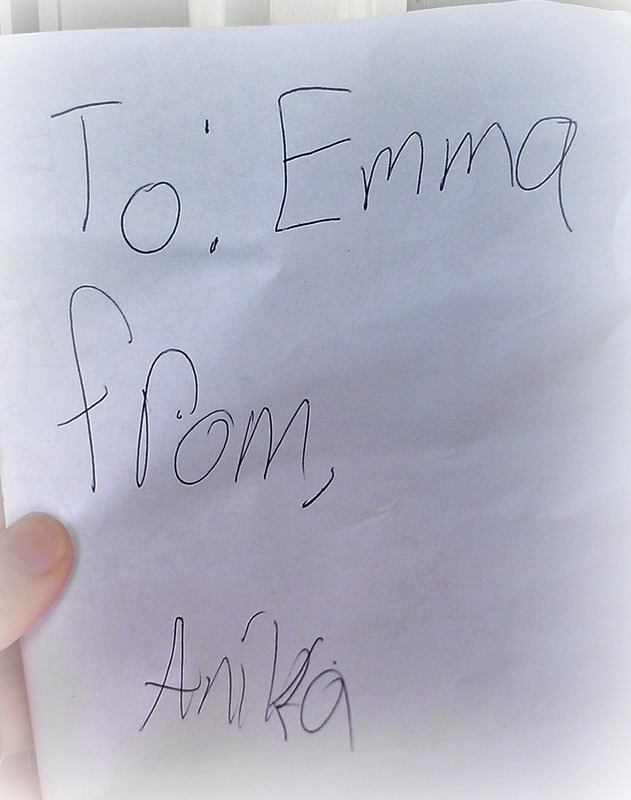 Anika was so very proud to be featured on “mom’s blog”. 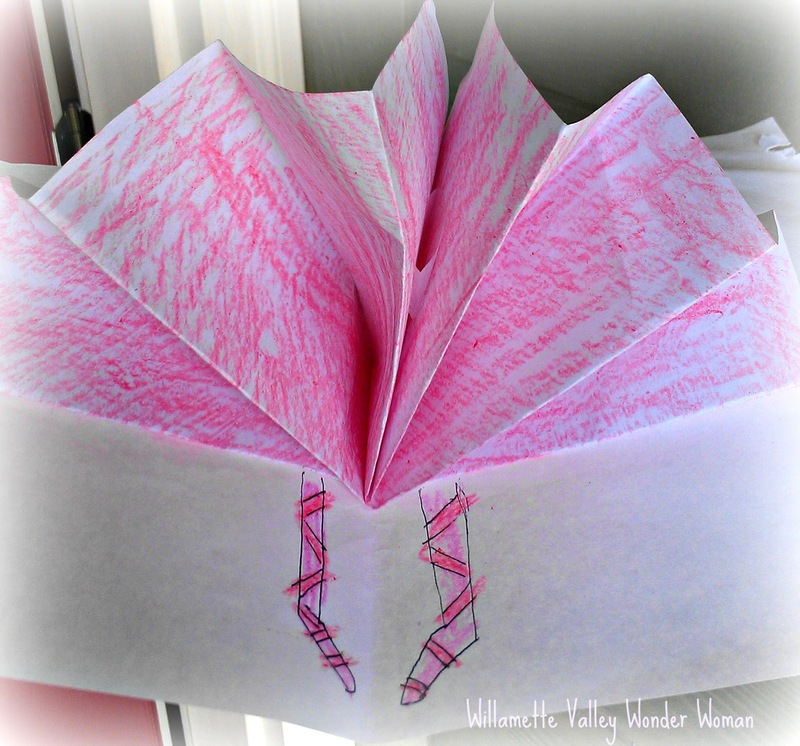 I definetely think we will be using this idea for an upcoming birthday or girls sleepover invites. Today I’m guest hosting over at Family Home and Life! 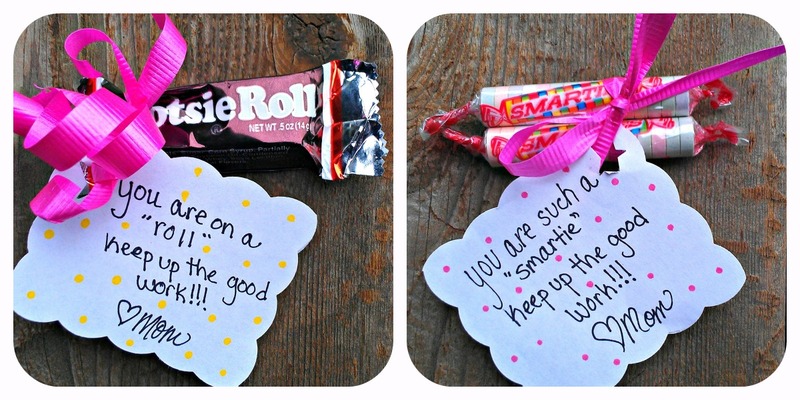 Read my Post “Sweet Encouragement” HERE and check out Connie’s wonderful website! Happy Wednesday everyone…the weekend is getting closer! Have any big plans? We will be heading to the beach to do a little end of the summer camp out! So guess what I will be working on today and tomorrow? Yup.. packing :). 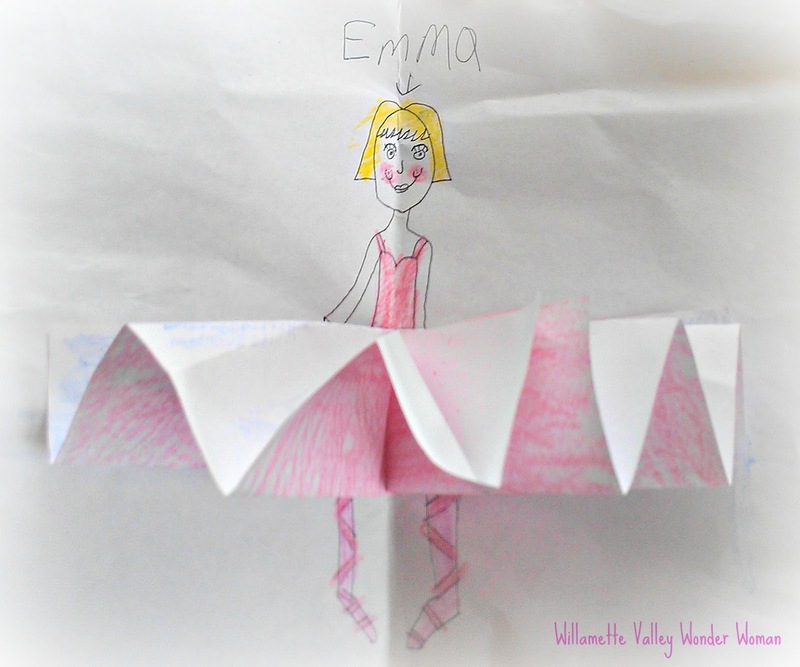 So last week I shared a little bit about my daughter’s 9th birthday party. You can check it out here. 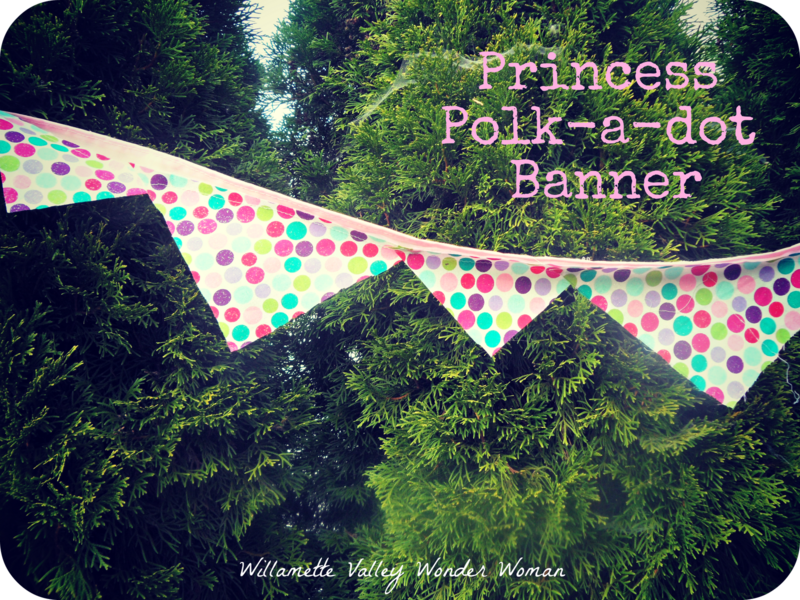 I also showed you my little polka dot banner I made…with my daughter’s hello kitty sewing machine…if you haven’t read that yet take a peak here. 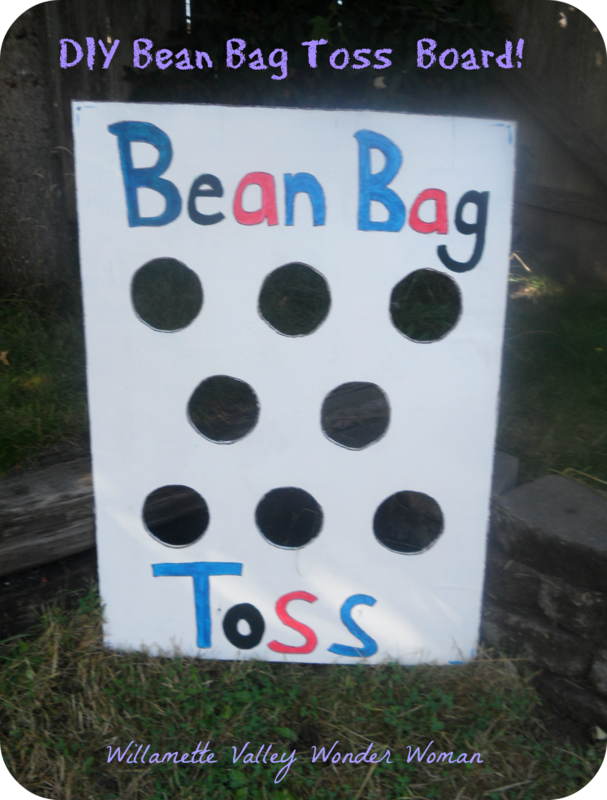 I also mentioned a little game I made, Bean Bag Toss…and I thought I’d show you a little bit more on our little project today…. It started out with an idea. Then my husband found an old scrap piece of plywood we just happened to have lying around, and I got to work. 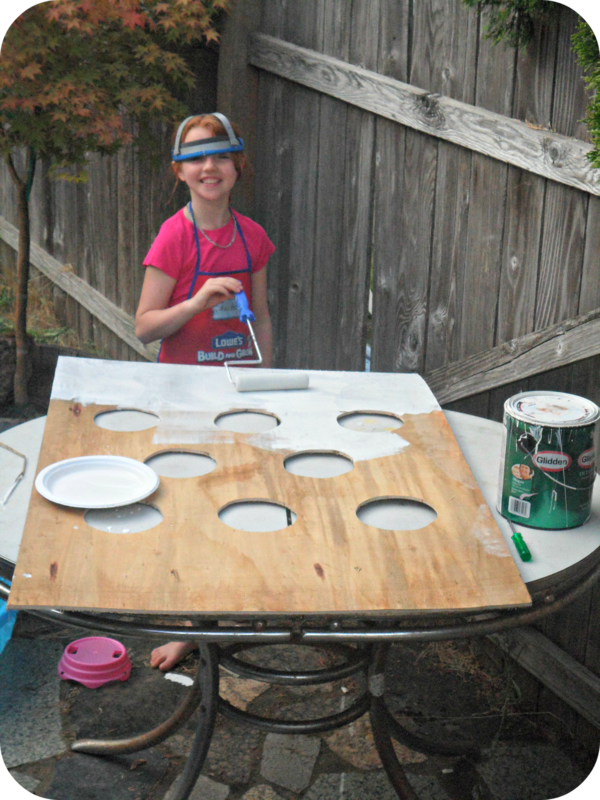 I traced circles onto the board where I wanted the holes to be, and then using our skill saw we cut the holes out. I then put my birthday girl to work painting. I think she did a pretty darn good job, don’t you? And there you have it! Not the greatest picture of it, but you get the idea! The best part is that Anika helped make it, and we will get alot of use out of it when friends come over! 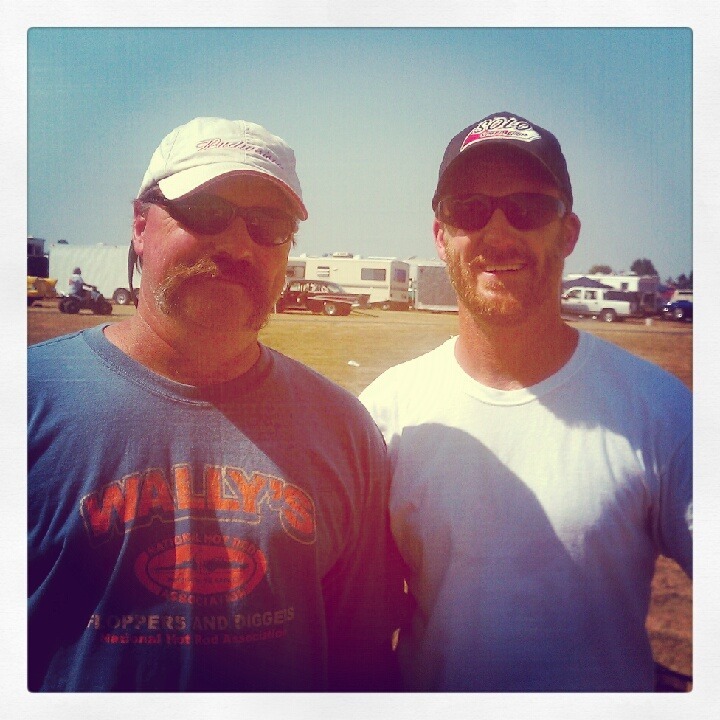 I am also loving me some Instagram lately, and here’s a couple pics I’ve posted. 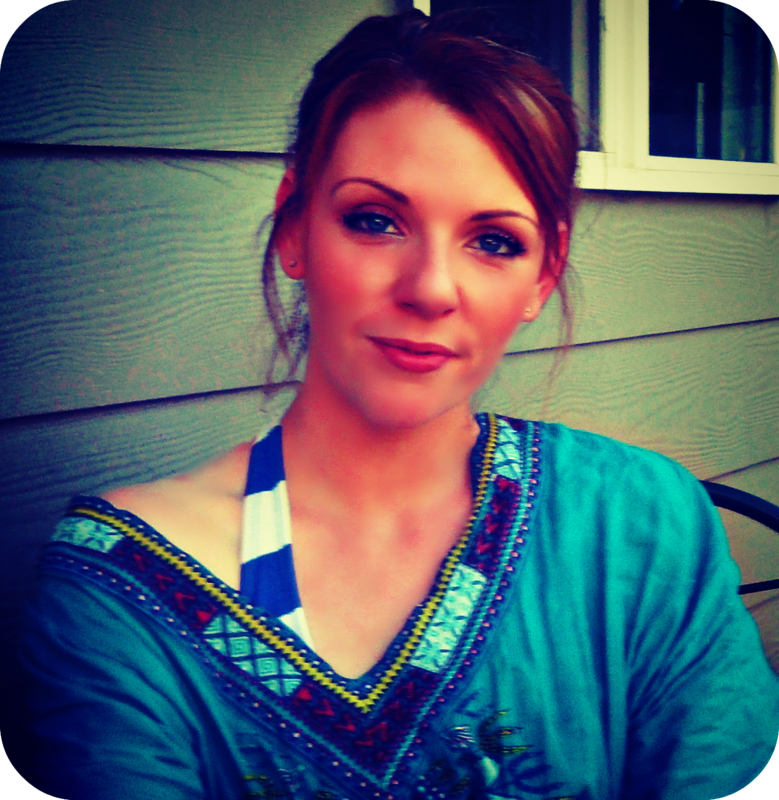 You can find me on there and stock me as well if you’d like… my user name is melissakaylene. 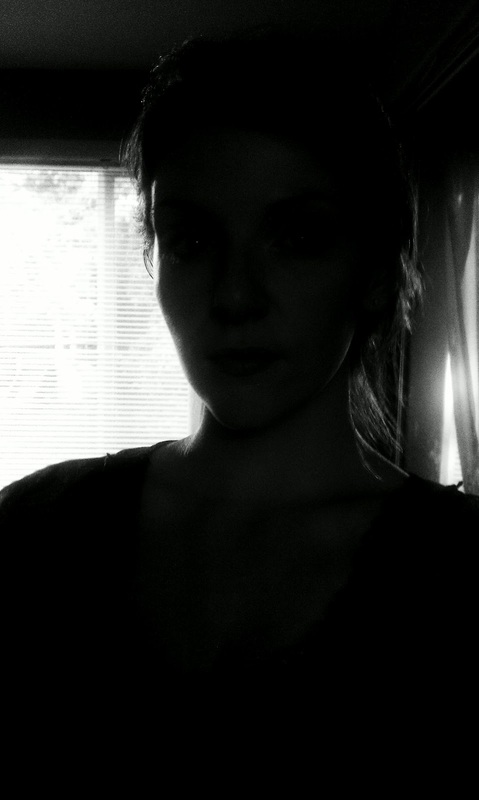 this ones perfect…its dark so you can’t see my exhausted face after taking care of sick kiddos! 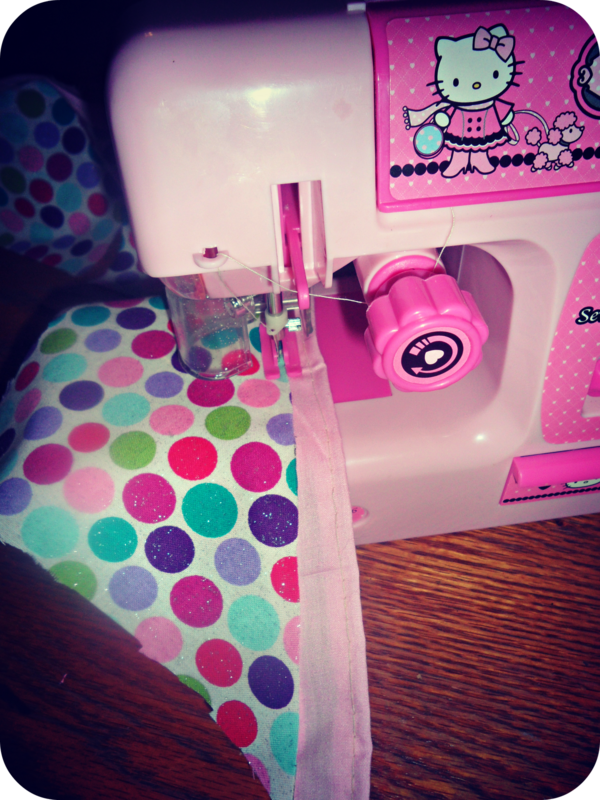 So I set out cutting 8″x8″ squares of the fabric, then cut a strip the entire length of the pink fabric 2″ wide. It was a nice hot day outside so I pulled up a seat on our back deck next to our ‘craft’ table and got to work. I folded the squares in half and ironed them. Then I cut them in half so I had triangles. I then took half of the triangles and did the same thing, so I ended up with some larger triangles, and some smaller ones. So, I have an old sewing machine that was given to me by my Mom, but it is missing a piece and I need to take it in. 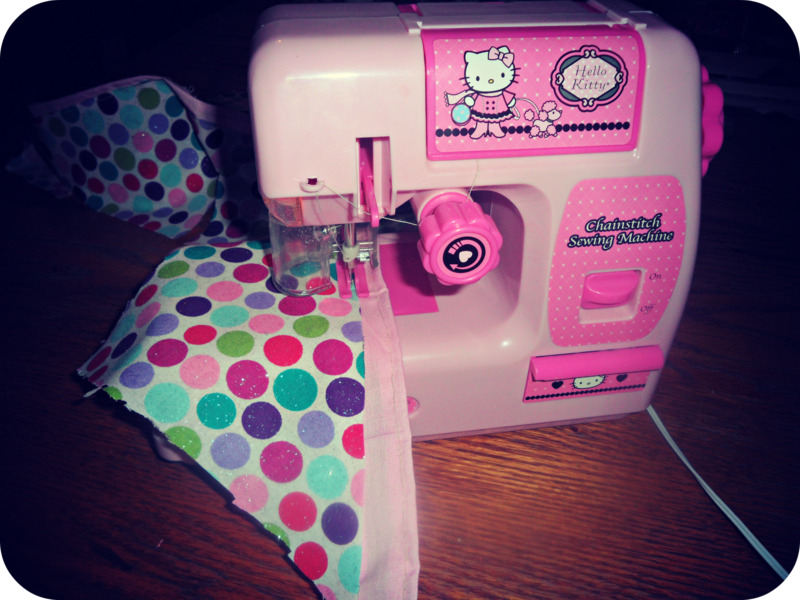 So I was super upset that I couldn’t finish my project….until I remembered that I bought my daughter a cheap-o Hello Kitty sewing machine last Christmas, and it had just been sitting there in her closet! 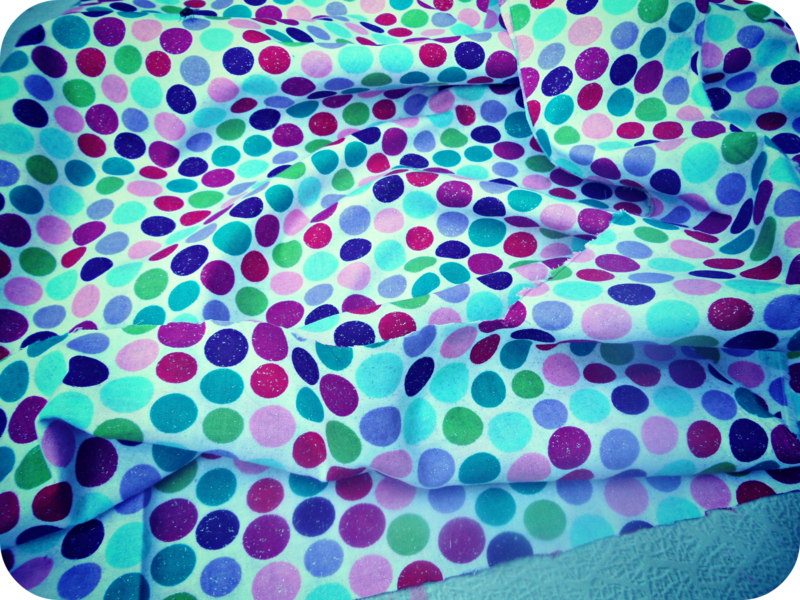 So yes, it was a total pain, but I managed to sew the banner with a battery operated machine for little girls! 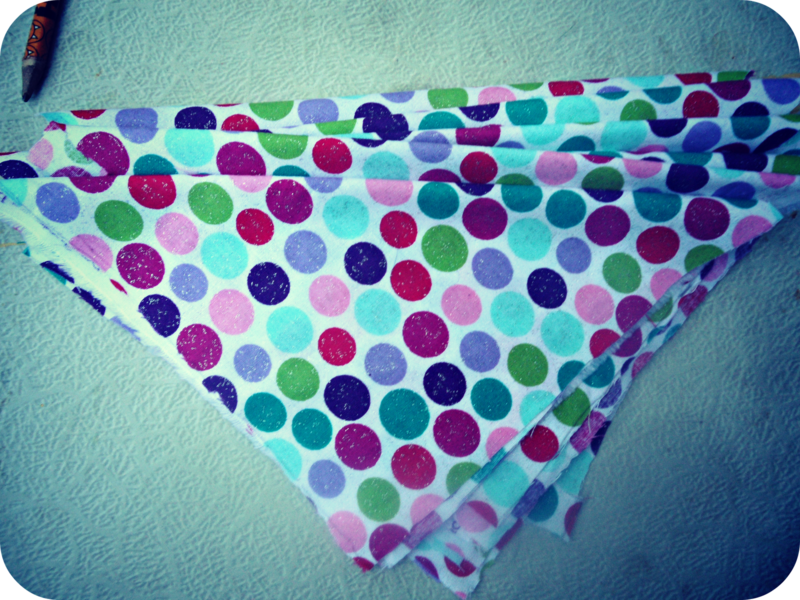 So I sewed the hems of the pink fabic strip, but didn’t bother with the triangles. 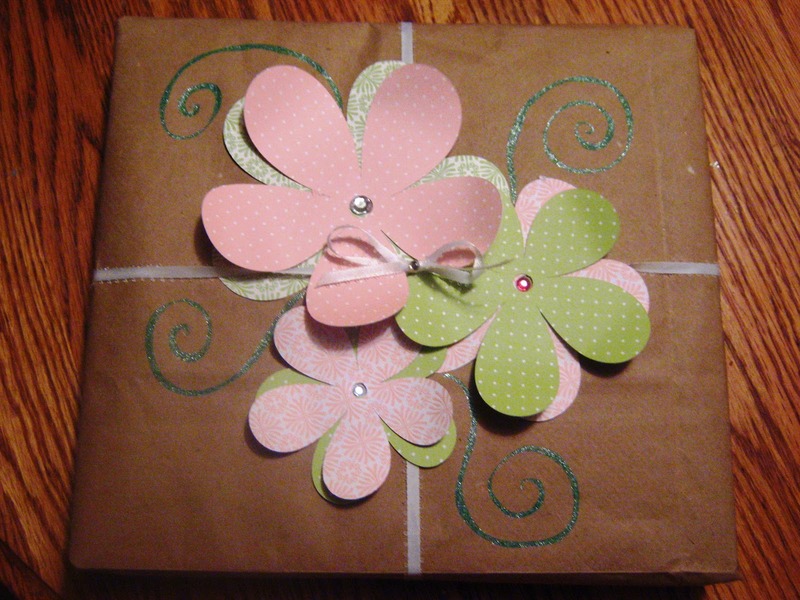 I’m not a perfectionist and am pretty sure a little ADD, because I just can’t do a project that takes me longer than a day….it turned out fine though for what we are using it for! 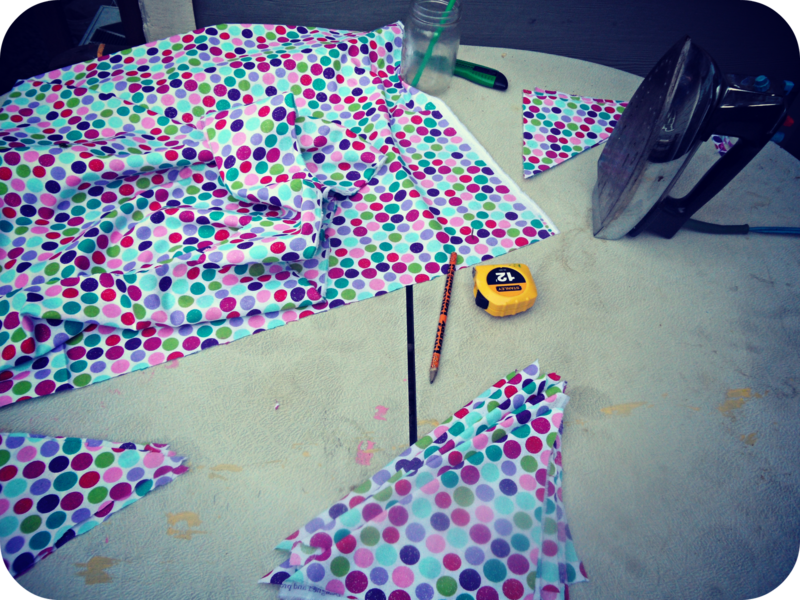 I’ve also made a couple tablecloths for her party, and am also working on a Bean Bag toss board…. I will be sure to post pics of those soon, and of course pictures from her slumber party!